Earlier this week, Democratic congresswoman Ilhan Omar suggested that AIPAC — and its associated donors — effectively dictate American policy toward Israel. Her argument has some basis in fact. Through its lobbying and coordination of campaign donations, the American Israel Public Affairs Committee has had a clear and significant impact on U.S. diplomacy toward the Jewish State (or so AIPAC’s members and donors have proudly claimed). Still, it is inaccurate to say that America’s deferential posture toward the Israeli government is all about AIPAC’s “benjamins” (it is also about American Evangelicals’ impatience for the eschaton, among other things). More critically, the notion that Jewish organizations use their community’s wealth to control foreign affairs is a staple of anti-Semitic propaganda. Thus, while Omar’s critique was aimed at a single pro-Israel lobbying group — and while her claims would have been plausibly correct, if modified only slightly — the congresswoman unequivocally apologized for her unintentional insensitivity to the historical traumas of the Jewish people. But for Mike Pence, that wasn’t good enough. On Tuesday, the vice-president revealed that he is so adamantly opposed to hate speech, he believes that merely using rhetoric that is reminiscent of anti-Semitic tropes disqualifies a person for high political office. Pence’s words here are both remarkable, and remarkably brave. 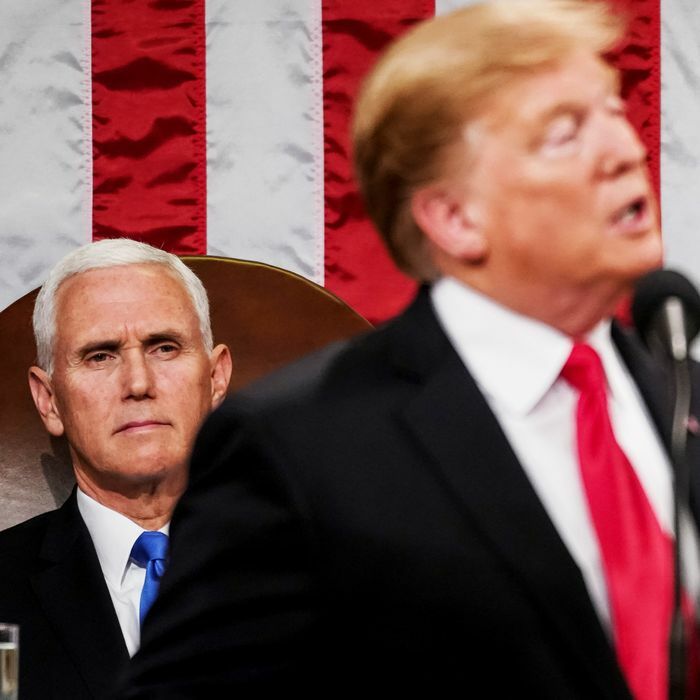 The vice-president is, in effect, calling for the immediate resignation of not just Ilhan Omar, but also of Donald Trump, and much of the congressional GOP. To interpret Pence’s remarks in any other fashion would be to suggest that his purported objections to anti-Semitism are purely opportunistic. And anyone who believes that Omar’s claims about AIPAC are a gift to violent anti-Semites (and thus, endangered Jewish lives) must feel the same way about Donald Trump’s decision to insinuate that George Soros was trying to steal the 2018 elections — by directing a caravan of migrants out of Central America, across the U.S. border, and then to polling places all across the country — just days after a neo-Nazi who subscribed to a nearly identical conspiracy theory shot up a Pittsburgh synagogue. So, barring the highly unlikely possibility that Mike Pence does not actually have much of a problem with anti-Semitism (but only with anti-Zionism, because he believes that Jews must assemble in Israel before the rapture can plunge them all into eternal hellfire), the vice-president has effectively just called on Trump to step down. And Pence is also ostensibly demanding that House Minority Leader Kevin McCarthy do the same; last fall, McCarthy tweeted, “We cannot allow Soros, Steyer and Bloomberg to buy this election,” insinuating that three Jewish financiers weren’t merely trying to dictate U.S. policy toward Israel with their money, but rather, dictate the outcomes of all U.S. elections. Of course, Pence’s new moral clarity will require him to resign from his own post (in recompense for his myriad offenses against Palestinians, immigrants, and the LGBT community). But when he does step down, he will be remembered as a good Christian man, whose opposition to hateful prejudice was earnest and unequivocal.